The term “Bossy” is entirely context specific. It’s usually used in association with children, giving out orders without listening either by the child or to the child, which let’s face it is sometimes necessary. When used professionally, it always invites clarification otherwise it’s difficult to interpret what the person means because “bossy” is such a loaded term. It usually refers to someone being assertive, direct, organised, all of which are positive attributes and necessary in most situations, we don’t always have time to negotiate. If you’re achieving results but considered bossy, then ultimately you have to accept that as “the boss” you’re never going to please everyone. If you’re not achieving results, then perhaps it’s time to review your approach in which case the clarification can offer useful feedback. It’s all about mindset. The word Bossy itself can’t be damaging, it’s just a word! It’s the way we choose to interpret and respond to it that can be damaging. 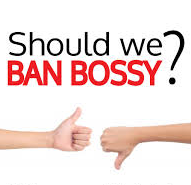 I asked a random selection of men and women how they would feel if called bossy and whilst the reaction from women was mixed and a significant proportion said they would feel bad or offended by it, men unanimously viewed it as either positive or dismissed it entirely. It’s all about mindset. Women generally seek feedback and want to please those around them, which is a very positive trait but the flipside can mean that we are also (over) sensitive to words. I certainly feel that putting a lot of effort into campaigning against a word is ridiculous and not really doing women any favours, instead we should learn to use feedback positively or simply dismiss it if it’s not useful. It’s not the reason fewer women progress to board level. Sheryl Sandburg, Beyonce, Victoria Beckham haven’t let it stop them pursuing an extremely successful career, despite claiming they have been called bossy at some point. I don’t believe it’s language that’s preventing women from progressing, more the limited employment options, which don’t allow any more than one life priority at a time. Dedicating 40+ hours each week to professional development leaves little time for anything else and it’s ignorant to claim we only have one life priority to manage at once. The more companies acknowledge this and actively support flexible working options like Jobsharing at a senior level and give Jobshare partnerships equal opportunity for employment in full-time roles, the more opportunity there will be for experienced, ambitious women to continue to progress up their career ladder and also grow as parents. Don’t get me wrong, Ginibee and Jobsharing is for men and women at all stages of their career. It’s great that we’re seeing more couples share maternity and paternity leave and dads working part-time than ever before. I think the next generation of exec’s will see a significant change in perceived equality in terms of career progression. If you have any thoughts on anything that has been discussed in this post or Jobsharing, please share your comments, I’d love to hear them.